Hello from Krabi! I just woke up and now enjoying a cup of tea on our balcony. # – Pick me up. This trip is Gareth’s company retreat actually, but I get to join because I satisfy his company’s conditions of either being a spouse or having co-habitating for more than two years, and being straight/gay. # – View from the lobby upon arrival at the resort yesterday. # – Hanging out on our balcony after checking in. OK, just an excuse to post this because I look deceptively slim albeit a little sombre. We slept most of yesterday away, waking up at dinner time for some local beef noodles. Not before we nick some wifi at the lobby though. We have complimentary wifi in the room now though so yay! # – First Thai meal. So delicious! Then we snacked on stuff we got from 711. Even in a small place like Krabi, the sheer variety of stuff pwns our 711 in KL. Found a hilariously named beauty product too. Well, right now we are contemplating lunch options – whether to have a beach picnic trying out more goodies from local 7-11 or a bus ride to town for some local food. For the first time in our entire dating history, we decided to throw our mothers together. For four full days, from KL to Hatyai to Penang and all the way back to KL, they had to sit together in the car, walk together in the sun & under the moonlight, eat the same food, sleep in the same room and on top of all that, deal with the two monkeys that are their son & daughter. 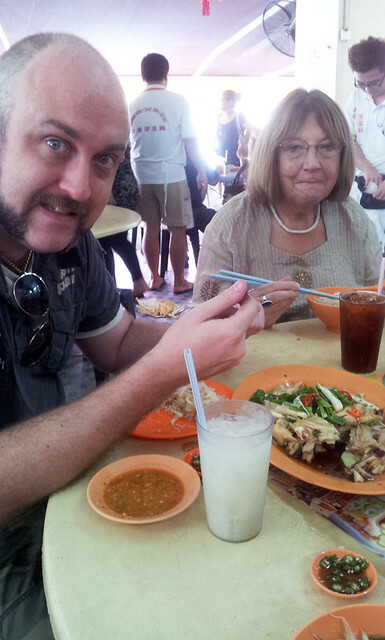 Our first meal on the road trip was Ipoh’s famous steamed chicken, sprouts and kueh teow noodles for lunch. DELICIOUS! I could eat Ipoh kuehteow everyday. # – With my mom. # – With his mom. It was a great holiday. I can’t believe it took us this long to do something like this. 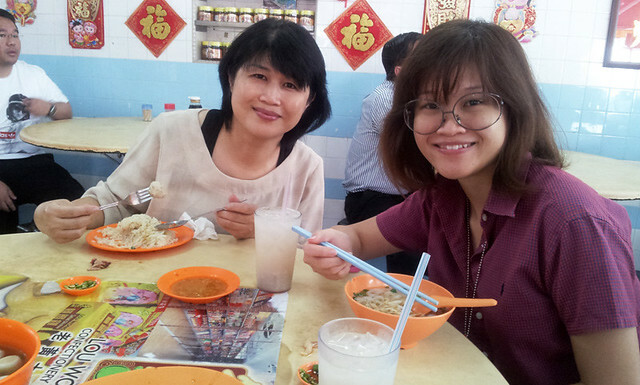 Holidaying with our moms is awesome cause we get to be children and get doted over. Like you know, when we went swimming, there’s always someone who would pass us towels and sunblock. Or when we’re out exploring, someone’s always got an extra bottle of water or someone’s always got an awesome hat that I could borrow to hide from the hot sun. I LOVE IT! 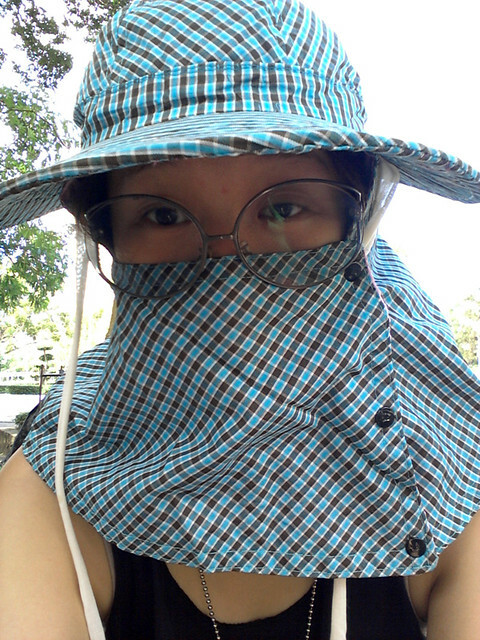 # – My mom’s incredible hat that kept me in the shade. # – In moms’ room, eating on their beds /evil laughter. I don’t know if it’s holiday for our momsies, but it’s definitely a kickass holiday for us…hehehehhehe. 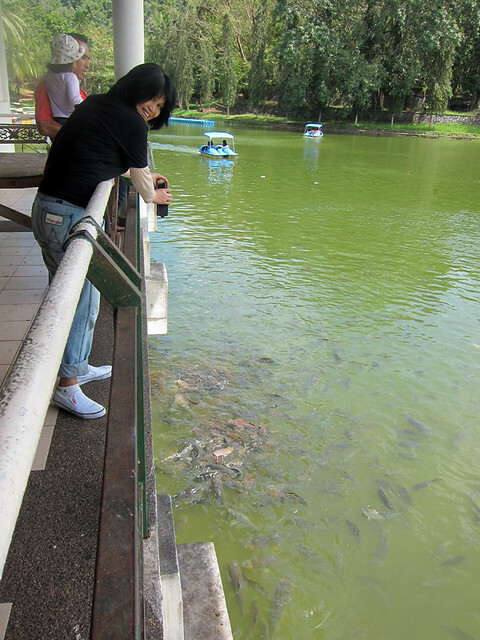 # – Mummy taking pictures of fish. 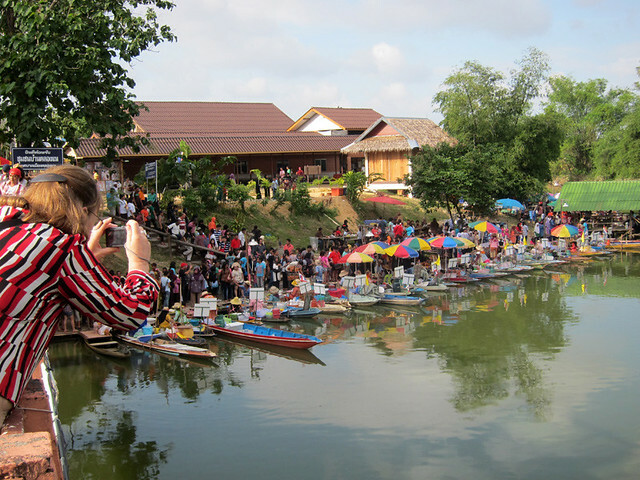 # – Mom taking pictures of floating market. 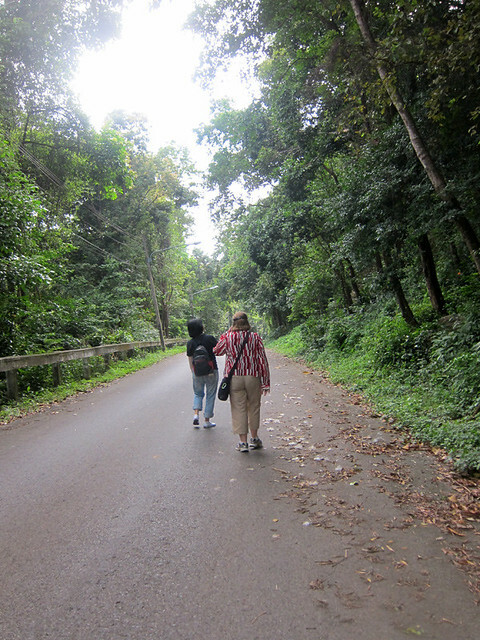 # – Mothers walking down a hill in Hatyai Municipal Park. 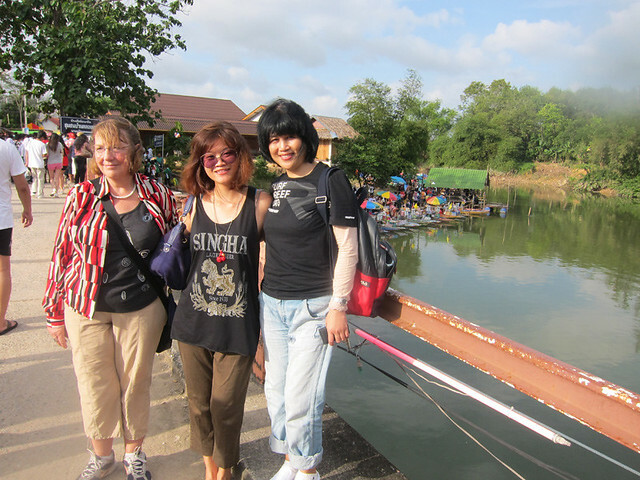 It was our first time seeing the floating market in Hatyai. It was pretty impressive actually. Loads of food and touristy stuff but most things go for only 20Baht. Cheap and fun! # – On the bridge to the floating market. 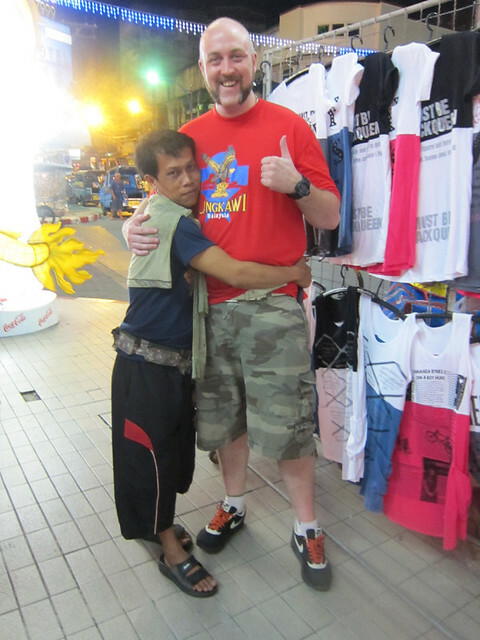 There’s this fella in Hatyai that sells clothes who was particularly attached to Gareth. He kept shoving a clothes hanger into G’s crotch, while threatening G to buy clothes from him. And when he refused to buy anything, he just hugged G, very tightly. We shopped quite a lot. My mom basically wiped out the pet section in Tesco Lotus. The dog beds were ridiculously cheap, like 370Baht for a mid size one! Where to find?? We got cashew nuts, dried fruits, booze, the usual suspects. G also bought me a set of 10 piece Anolon saucepans and pans with some kind of awesome copper base and oven safe up to 260 degrees celcius. My oven doesn’t even go up that high! 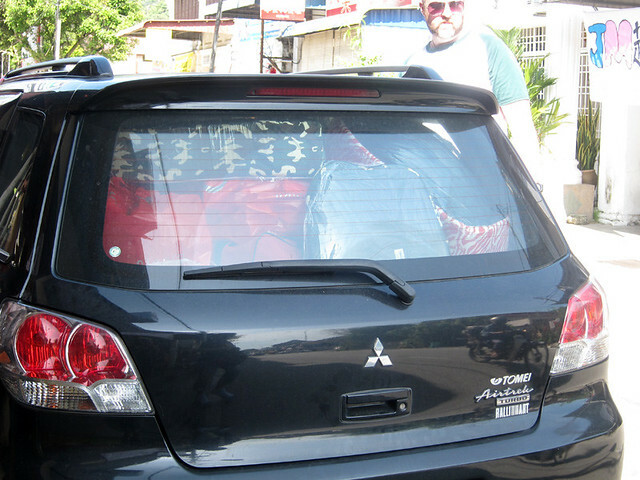 <3 Sorry, housewife talk overloads :P # - Car so full with shopping until back window completely blocked out. 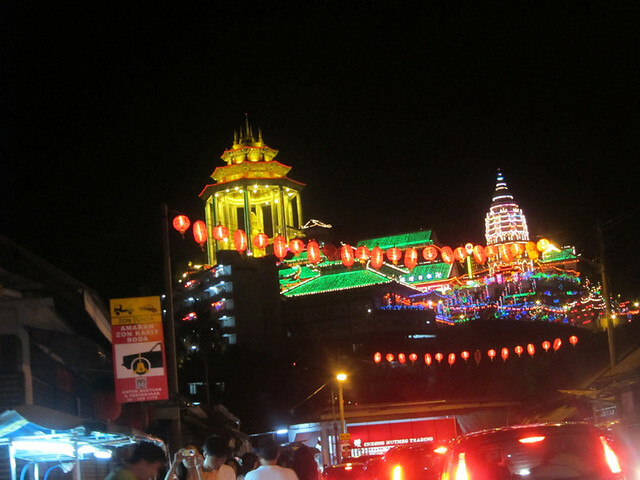 From Hatyai, we drove down to Penang for an overnight stay. 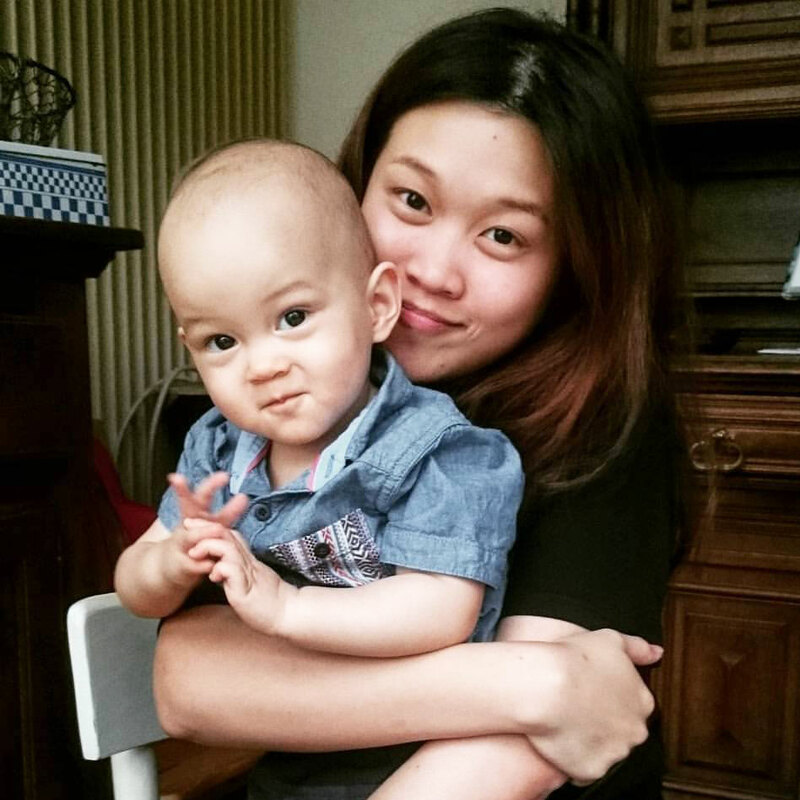 There was an episode where someone went hysterical because she almost couldn’t hold her pee anymore while getting stuck in a traffic jam in Penang. # – Stuck in crazy jam for over an hour to see this. 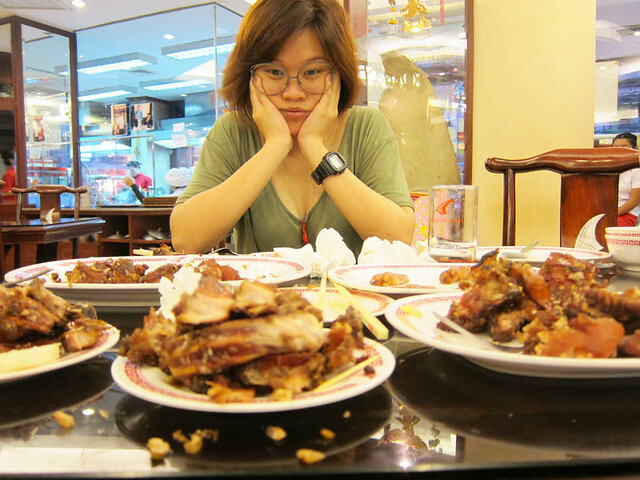 Anyway, like we always do in Penang, we ate too much and still ended up wishing we could eat more. 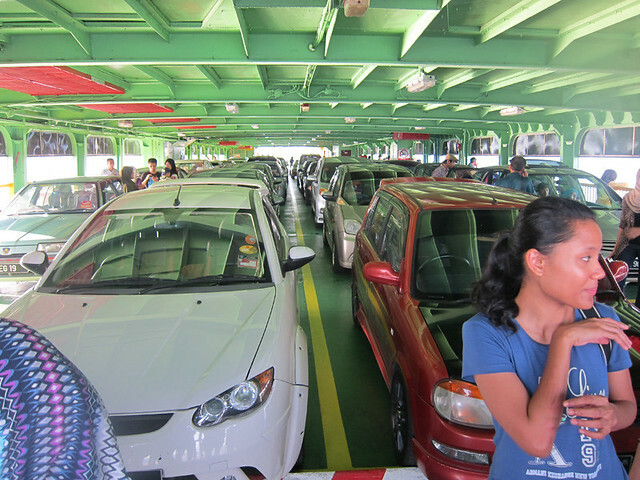 We left Penang on a ferry, the perfect ending to our holiday. # – On the upper deck of a ferry back to mainland. 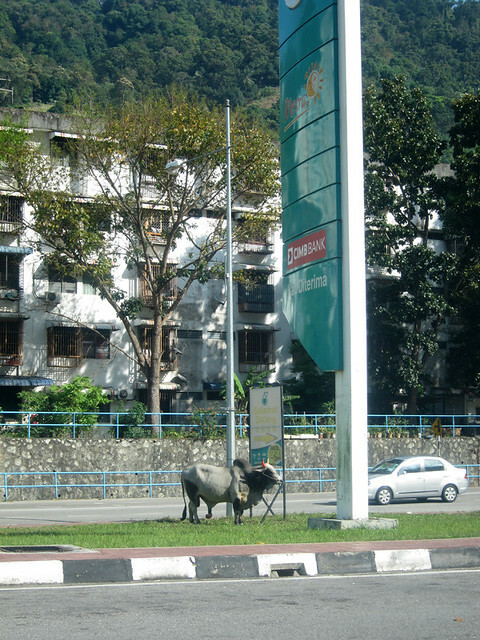 I shall end this post with a picture of a random buffalo at a petrol station in Penang. It had really saggy, large testicles. Have a good weekend, peep! The suckling pig in Bangkok. The BF’s plans were derailed thanks to our flight’s delay. Instead of arriving in Bangkok just in time for our first Thai lunch before checking into our hotel, we arrived in front of our hotel, exhausted and famished. The first thing that greeted me after I exited the taxi was the picture of a chubby man with his thumb up over a roast suckling pig, going for 1500 baht. The image burnt into my brains. 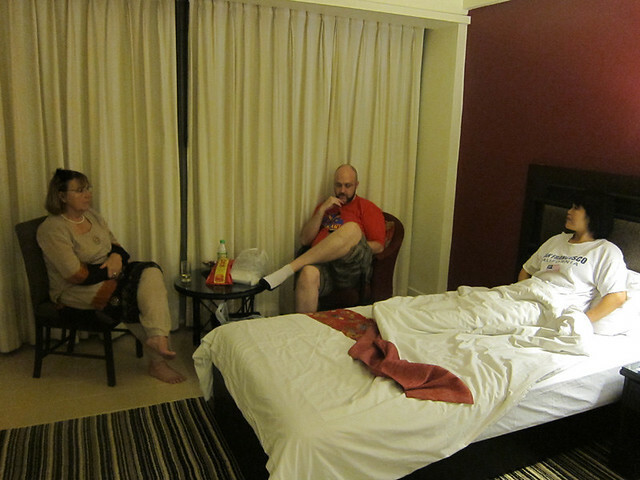 We checked in after what seemed like a really long day. 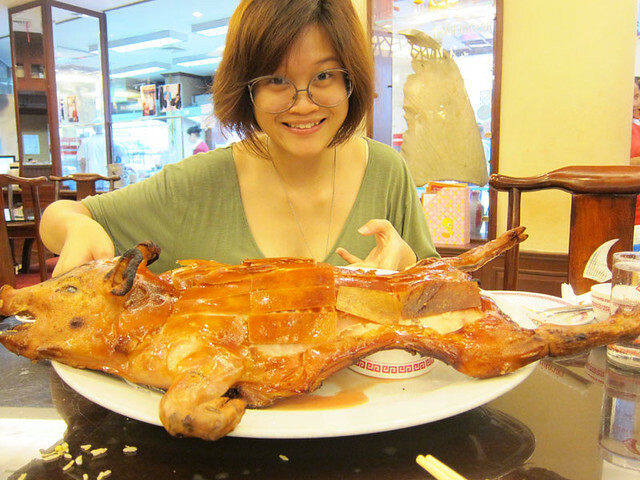 While I oohed and aahed over my BF’s brilliant choice of hotel (Shanghai Mansion), at the back of my mind I had only one goal…to convince him to eat a whole suckling pig with yours truly. And that…is why he’s the love of my life. 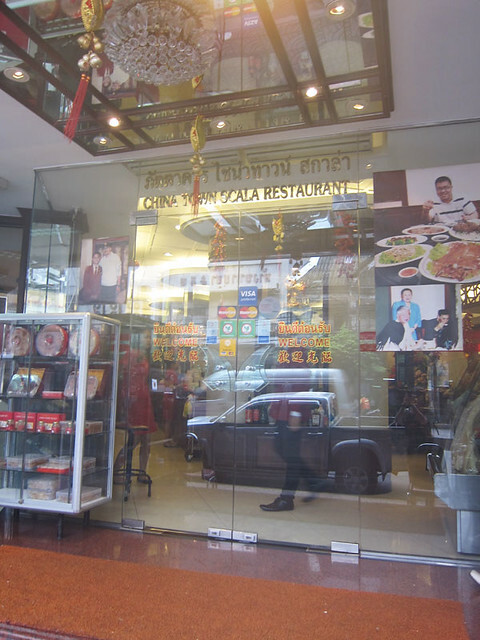 The restaurant is called “China Town Scala Shark Fins Restaurant”. There were dried shark fins all over the place but we weren’t there for the fins. 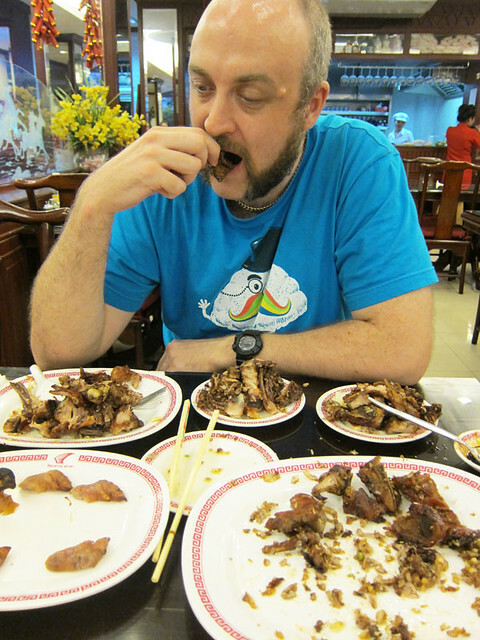 We probably shouldn’t have supported a restaurant that sell shark fins anyway but it didn’t cross our minds then. 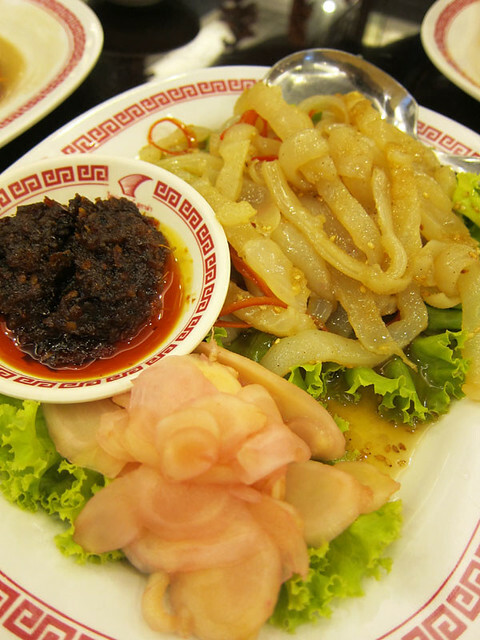 # – China Town Scala Shark Fins Restaurant. I was surprised to see a bunch of Malaysian girls around my age at another table having individual claypots of shark fins. Stupid girls. Yes, I judge them. 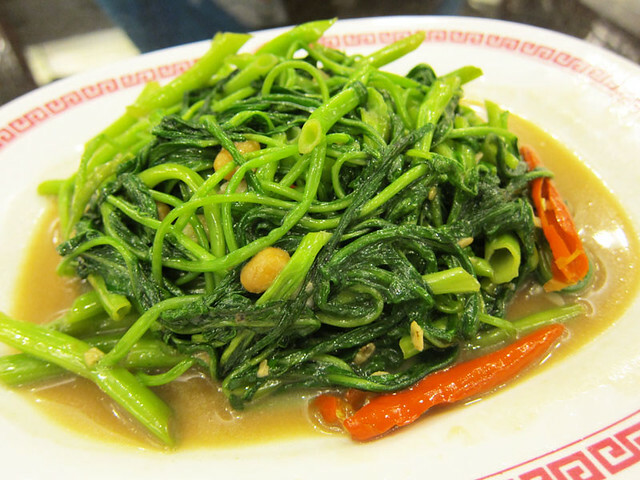 # – Really fresh fried kangkung (water convolvulus). Crisp and tender, yums! 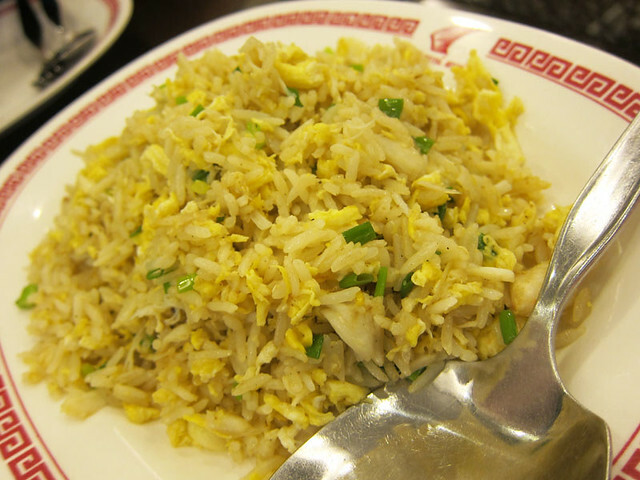 # – Crabmeat fried rice. Eggy with sweetness of crabmeat coming through, pretty good. # – Cold jellyfish with sesame. Wasn’t bad, I’ve had better. We hoovered up the rice, vegetables and jellyfish like it’s our first day out of prison. Finally the pig made its grand appearance. # – That glee in the eye. The way the roast suckling pig was served was actually quite unfamiliar to me. There were only crispy skins and honestly we felt a bit confused because if it’s just pork skins, there really was not much to eat! 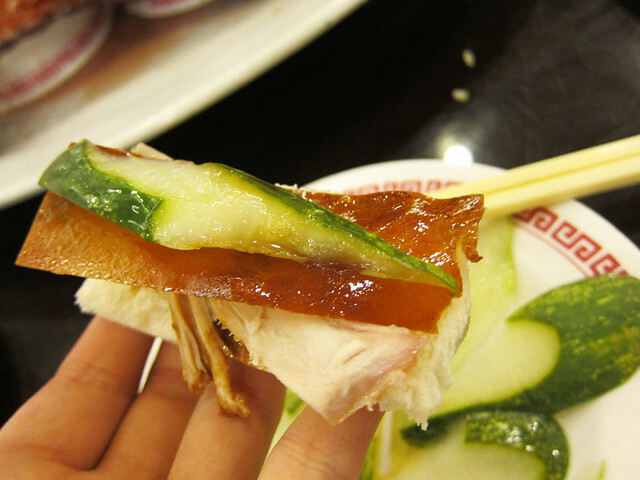 # – Suckling pork skin with bread and pickled cucumbers. We realised that the flesh was still attached to the carcass so we started hacking at it with a fork. Little did we know that our innocent activity soon started a sort of commotion. One of the waiting staff who was observing us came to us in a hurry and with the very little grasp of English she had, kept saying, “no cook”, “no cook” while her hands kept making this sawing motion. We were baffled but soon deducted that the chef would pop by in a bit to professionally slice off the flesh. 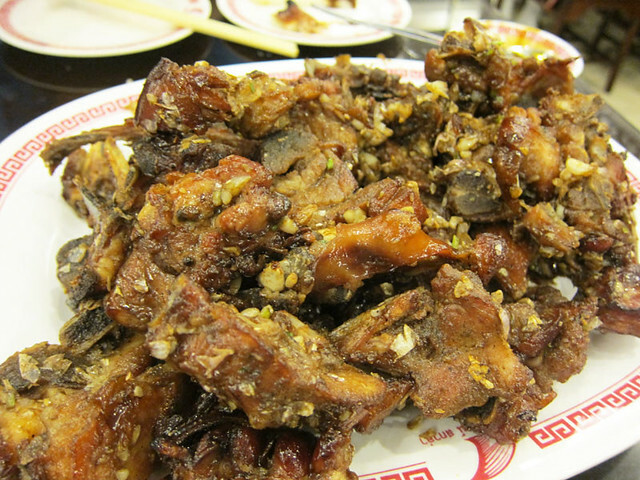 We stopped eating altogether because we thought we had wanted to save the crispy skins to be eaten with the meat. 15 very boring minutes later….the same waiting staff got one of her colleagues with better grasp of English to talk to us. But you got to give it to Thai customer service. They do try their best there. In the end, we settled on garlic and pepper to be cooked with the rest of the pig. It was a fine decision because it was delicious….and huge. 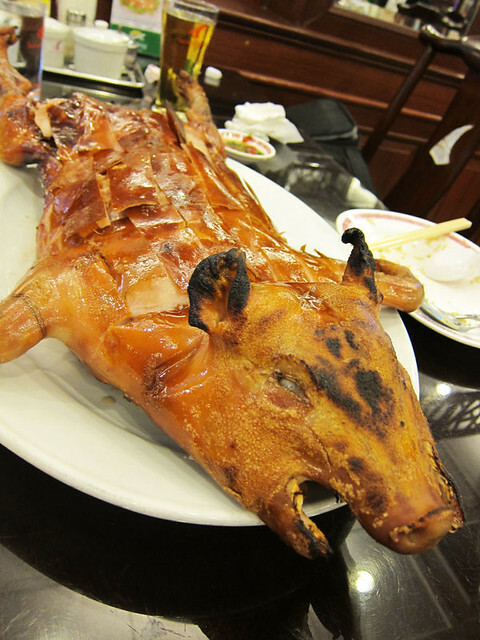 # – Our now chopped up garlic pepper suckling pig. # – The BF and his pile of bones. # – And that…was my expression for the rest of the day. Yes, it was an absolutely splendid day.